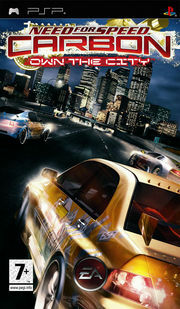 Need for Speed Carbon: Own the City is a special NFS Carbon-styled game developed for the PSP, Nintendo DS, Gameboy Advance, and Wireless platforms (handhelds). Own the City is a completely different game compared to the other versions of Carbon, although it is built on similar storylines and implements similar ideas. Own the City will also feature some exclusive content in terms of cars. Rumor has it that the Audi TT and Chevrolet Cobalt SS are exclusive cars for this version.